Simon During. 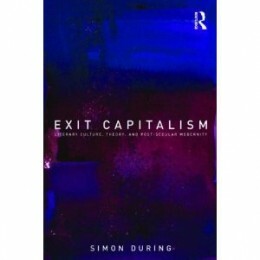 Exit Capitalism: Literary Culture, Theory, and Post-Secular Modernity. Routledge, 2010. 280 pp. How do we refuse capitalism? Should we? This is Simon During’s central question in his temporally vast and historically deep book Exit Capitalism: Literary Culture, Theory, and Post-Secular Modernity. The book begins with a reflection on his experience at the Sydney Museum of Modern Art’s 2008 Biennale exhibition. During recalls looking up during a luncheon of “beetroot salad [which] blends subtly with an Otago pinot noir”; before him is the advertisement for the exhibition: “positioned exactly between the Opera House—that icon of Sydney’s Pacific glamor—and an elegant Mediterranean-style apartment building on the harbor’s far shore” the sign boldly asks “Is this freedom?” His answer is complicated and, I’d wager, familiar: “whatever ‘this’ is, it’s pretty damn good,” he writes (vi). But of course it isn’t good at all. As I read During’s book, signs of a ‘double dip’ recession are becoming harder to ignore. The Dow plunges twice in as many weeks, Spain and Italy are on the brink of declaring bankruptcy, the United States is embroiled in a bitter bicker over whether or not to raise the already gargantuan debt ceiling, and my own country of residence, Canada, can no longer hide behind its façade of fabricated benevolence and environmentalism. Riots continue in London and, save for a smattering of mostly alternative or academic writers there is very little in the way of engaged media analysis over the reason for these riots which seem so clearly connected to immense systematic inequalities levied at Britain’s racialized youth and working class populations. So, in our current moment where capitalism appears to be a freeway with no viable exit ramps, is During’s question even a viable consideration? To begin with, During himself isn’t so sure. He writes “much of this book, placed in no-exit indirection, explores, from a literary-historical point of view, certain paths through which we have arrived at where we are now” (vii). And where we are now, for During, is “not at the sanctioned ‘end of history’ but at something like its opposite. Capitalism without hope, hopeless capitalism, endgame capitalism” (vii). Interestingly, and in some ways problematically—at least for this decidedly post-secular reader—During’s strategy for reintroducing hope begins by tracing the “mid-eighteenth-century moment in England when market-oriented culture gradually displaced the old oligarchic order dominated by the Anglican Church” (vii). For During, this shift to market-oriented culture effected a loss of Europe’s historical sociology (3). What results is a text that is hugely disparate in its case studies, yet ultimately compelling and cohesive in its argumentation and central thesis. The text is broken into two sections and then subdivided into discrete case studies. Part one, “Modernizing the English literary field,” opens with a chapter considering the separation of church and state through the rise of modernization. After the “Glorious Revolution” of 1688, which saw the overthrow of King James II and the ascension of William and Mary, the “Anglican clergy became increasingly professionalized,” and more thoroughly entrenched in state politics (5). These clerical shifts had intrinsic effects on the content of literary production: “literature became less centred on polite learning, including classical scholarship, and more centred on sympathetic imagination and the suspension of disbelief” (5). Thus as the Church became more intertwined with state politics and began to push to professionalize within its own “filiative chains within the elite” literary production became increasingly crafted for an emergent marketplace, rather than for its own sake. During summarizes the effects of the comingling of Church and State as follows. Literary production was divided into two sections. The first was targeted at the marketplace and it “disseminated practical information, discipline, and various kinds of readerly excitement. This section of literary production was predominantly controlled by “market-attuned book-trade business men who turned away from collaborative enterprises and concentrated on distribution (export) marketing, periodicals, and the developments of new formats (especially periodicals).” These businessmen aimed their sales pitch at “discretionary consumers from the middling ranks” (6). The second section of literary production came from the ranks of the “gentlemanly world” whose intellectual matrix resided in “the established church” (6). Like the market-attuned book-trade, this section of literary production was also variegated; however, it differed in its aims to legitimize the intellect of the episcopate and ameliorate fissures in the church itself (6). There were two other sections of corollary literary production: print production aimed at the medical and appellate professionals of the day and the print production of and for groups on the margins of the church, most especially republicans (6). Here, then, at the end of the first chapter lies a hint of During’s overall thesis. If literary production becomes divorced from both the spiritual realm that is Church purview, and if it instead is aligned with affect, then it is possible that literary culture may offer tactics for refusing our current capitalist condition. “Interesting: The politics of the sympathetic imagination” makes up the final section of part one. During’s analysis gets to the heart of what I find so maddening about the omnipresence of “interesting” as an evaluative term in critical literary writing. The evaluation of something as ‘interesting’ effectively masks the ways in which discourses surrounding the politics of sympathy are, at their root, often both politically and ethically paralyzing for the individual. During teases out a relationship between the “politics of pity” and the eighteenth-century modernization of the literary field in order to suggest that sympathy has become enmeshed with a “more powerful but much less visible and contested category: that of the ‘interesting’” (40). During begins his consideration of the interesting with a far more recent event than those he’s previously interrogated. In August of 2001—prior to the events of September, which, among other things, ushered in a renewed era of state sanctioned racism—the Australian government refused docking to the MV Tampa. Tampa was a Norwegian tanker that was carrying 430 refugees rescued from their sinking ferry. The tanker was not allowed to dock on Australian soil, and rather was “boarded by troops, and sailed under duress to Nauru, a remote, poor, ecologically devastated Pacific island whose leaders…allowed the asylum seekers to be disembarked in return for the provision of health care and other benefits to their own citizens by the Australian government” (39). He relates his sense of powerlessness in learning about the Tampa situation and suggests that the feeling of powerlessness was undergirded by the fact that there was no sustained public outcry. Moreover, he posits that there couldn’t have been a sustained public outcry because the “language of rationality had largely been preempted”(39). In other words, by coopting and reorienting the language of protest, the government foreclosed any possible resistance. Recalling Sianne Ngai’s neologism “stuplimity,” During positions the public reaction to the Tampa as “sympathetic compassion,” or “emotion across a distance” (40). Drawing on recent work by Martha Naussbaum and Lauren Berlant, During connects sympathy to liberalism in that both “presuppose a fundamental distance between people” (43). Publicly acceptable and comprehensible emotions are transformed by the always-already political; compassion becomes sensibility, and sympathy draws people together over a common cause. However—and here is the crucial bit—while “the interesting and the sentimental both engage” there is no necessity for engagement to lead to action. Which is to say that affect masks and potentially forecloses public action. “Towards Endgame Capitalism: Literature, Theory, Culture” is the second part of During’s text and it picks up on the contemporary example of the Tampa. The opening chapter of the second part, “World Literature, Stalinism, and the Nation: Christina Stead as Lost Object,” first offers a reconsideration of the category of world literature, and then embarks on a close reading of the Australian writer Christina Stead in order to make an argument for the provisional return to evaluative criticism. For During, the renewed focus on world literatures signals not only a reaction to the “cross-border flows of tourists and cultural goods around the world,” but perhaps more so an expression of “anxiety concerning literature’s decline as a response to its commercial cross-media globalization” (58). Echoing the lament of many a textual scholar, During posits that in our current moment one needn’t actually read to be engaged in the world literary production. During relies on Pascale Casanova’s The World Republic of Letters (1999), which comes out of Marx’s prescient statement that capitalism’s aim to unify the world market will gain intellectual traction when “from numerous national literatures and local literatures there arises a world literature” (Marx The Communist Manifesto 34). The “national vernacular literatures” begin to view one another as rivals due to the material and symbolic global system of rewards that are marketed under the sign of international genius (60). Literary capital, which differs from pure capital, can be divided between the anachronistic and the modern: regions on the periphery of the global imaginary produce anachronistic works, while metropolitan centres which have attained a certain degree of literary autonomy, produce literary capital that is divided between the anachronistic and the modern. And, while it is possible for so-called peripheral literature to join the global canon, this requires a “metropolitan act of consecration” that is literary rather than political, for as During has already argued in Part One, literature has the potential for autonomy, and, as he’ll go on to explain, in the equation of secular and religious there is always a challenging and autonomous remainder (61). Using Stead as his case study, During tests Casanova’s theory. Stead was a prolific writer, a committed communist, she travelled extensively, and her writing has not been canonized either nationally in Australia, or globally. During embarks on a careful and scrupulous close reading of Stead’s novel Cotter’s England to suggest that a return to evaluative criticism may remediate questions of canonicity. During concludes that questions of canonicity need to be addressed “across two barely separable registers: the first critical, the second institutional” (93). The penultimate chapter, “Socialist Ends: The Emergence of Academic Theory in Post-War Britain,” traces three loosely connected phases in the development of an institutionally based theory. During first turns to Iris Murdoch’s 1958 essay “A House of Theory,” which posits theory as an area of translation across knowledges, and which has the potential to “refresh the tired imagination of prose.” During cites the theory that was imported into British socialism after the decline of the New Left (mainly Gramsci and Althusser), the literary post-structuralism that gained strength in the United States (de Man, Derrida), and the “discrete formation of theory inside the humanities” that arose after the failed youth movement of the 1960s and included figures such as Deleuze, Lacan, Lyotard, Kristeva, Foucault, Irigaray, Baudrillard, Adorno, and Benjamin (97). The objective of theory was to forge a “critical public” (101), but the mutations of capitalism proved an unanticipated challenge in that “capitalism itself was constituted at several levels,” all of which required constant “intellectual legitimation” as it undertook “equally constant regrouping of interests and positions of power” (103). The task for the socialist in this environment was “not to emancipate human beings …but to articulate a new model of civilization” (105). However, this ambitious and effervescent aim was unsuccessful. The failure of 1968 to secure any sustained revolutionary momentum “marked the end of the hope that humanist thought of the culturalist heritage could provide an effective counterforce to capitalism” and also simultaneously severed the relationship between leftist academic theory and public policy and journalism (111). The turn to an increasingly rarified theoretical methodology effectively bifurcated literary studies from cultural studies. “Completing Secularism: The Mundane in the Neo-Liberal Era” reads Charles Taylor’s A Secular Age to posit the mundane as a viable mode of refusing capitalism. Embarking on a sustained critique of Taylor’s subtraction thesis (namely, that the secular is what remains when we subtract the religious), During posits the mundane as a genuine challenge to the secular and, by association, the State. “The mundane falls out of academic knowledge,” writes During, “after all, the modern university system is sanctioned by the social utility it produces” (121). For while “endgame capitalism does produce from within mundanity an experience that bears the weight of two great, but less compatible Western traditions—orthodox Christianity and aestheticism” it is possible that cultural conservatism may also be able to “generate complex, weight-bearing, posthistorical forms of living in the mundane” (130). During does in fact offer a provisional answer to his opening questions ‘is this freedom’ and ‘how can we refuse capitalism?’ During’s conclusion, “Refusing Capitalism? Theory and Cultural Studies after 1968,” functions as a coda to the current intellectual moment. Academic theory today, for During, is both more political and more theological (131). The critiques mobilized by the likes of Deleuze and Derrida are no longer avant-garde; moreover, they have been supplanted by “an intellectual impulse to reconnect theory to radical politics more directly” (131). Not only is theory oppositional to cultural studies, current forms of theory are being actively avoided by Anglophone literary studies (131). In positing that the “recent theoretical turn which allies theology to gauchisme responds to the end of hope that capitalism’s triumph carries with it,” During offers a practical step forward. Academics would do well to consider socio-historical events in order to formulate a rigorous and radical critique of capitalism (During cites the French Maoist—namely Badiou’s—turn to militancy and the British New Left’s turn in the 1960s to what we now call cultural studies). What next steps are taken up on campuses and in classrooms will be up to those of us occupying positions of relative power. No individual can effect a refusal of capitalism alone, but we must continue the work of imagining. Big, warm, genuine thanks to colleague, friend, and co-conspirator Geordie Miller for his constant willingness to think through huge ideas. Thanks too to the Dalhousie Theory Group (Geordie Miller, Alice Brittan, Anthony Enns, Jason Haslam, J. Matthew Huculak, Travis Mason) for reading, discussing, and producing provocative conversation on this and other books. Ngai, Sianne. Ugly Feelings. Cambridge: Harvard UP, 2005. Print. Erin Wunker is Assistant Professor in the Department of English, Dalhousie University.